We were robbed! The burglar broke in our house and stole the strangest thing: leftovers. That was my first though when I went to make my lunch the other day. The container was missing a big portion. Perplexed and shocked pretty much describes how I felt. Why? Because there is no way my husband ate the leftover Creamy Blue Cheese Pasta with Steak and Bacon. Maybe I slept walked and ate it during the night. Nah. I’m a very sound sleeper. Our hounds haven’t figured out how to open the fridge. They may one day. Both are very smart. One person had to be the culprit. I still had my doubts. Why did I doubt my husband ate the pasta? Here’s the run down…. He does not like blue cheese at all. Pasta is something he rarely eats. Eating asparagus is a rarity for him too. Believe it or not, he told me recently he was tired of bacon. Steak is the only component I know he truly enjoys. Of course I had to ask. Sure enough, he said he ate it. Guess what? He liked it too. I’m still shocked. The good thing is I know I can make this again for dinner. And he’ll eat it. YAY! 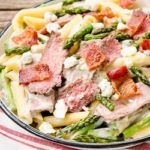 Creamy Blue Cheese Pasta with Steak and Bacon is luscious. 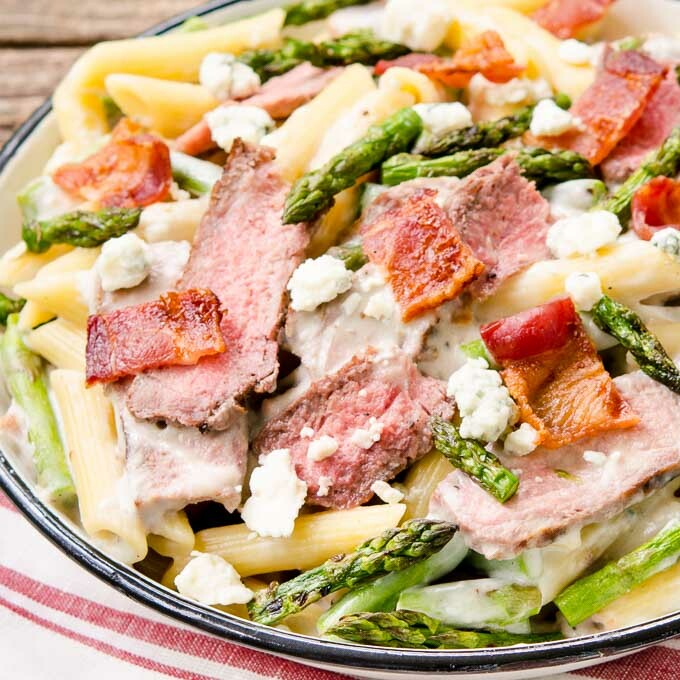 Penne pasta, grilled asparagus, steak, and bacon are divinely coated in a rich, thick blue cheese sauce. Total comfort food at its finest. Seriously like heaven in a bowl. How much do you like bacon? Bunches? It’s your lucky day! Scroll way down to find a big list of recipes with bacon by Sunday Supper tastemakers. It’s the tasty theme this week. Big thanks to Erica of The Crumby Cupcake for hosting. How about even more recipes with bacon? A few of mine are Baked Beans with Bacon, Grilled Bacon Onion Cheese Flatbread (Flammkuchen), Skillet Buttercup Squash with Bacon, and Spinach Salad with Warm Bacon Dressing. 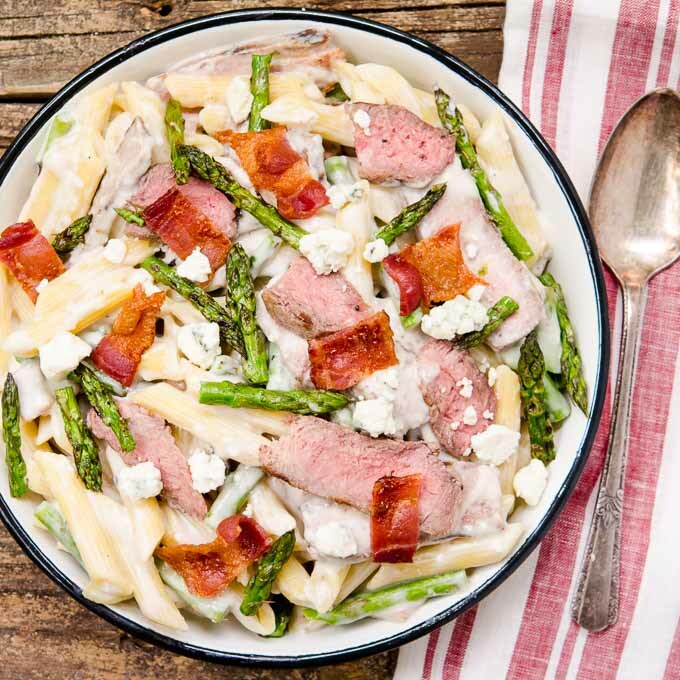 Creamy Blue Cheese Pasta with Steak and Bacon is a scrumptious hearty meal. It's comfort food and something special to satisfy many cravings at once. Cook bacon until crispy according to package instructions. Transfer bacon to a paper towel lined plate. Once bacon is cooled, cut into bite-sized pieces. Place steak on a plate or platter. Drizzle 2 teaspoons olive oil on steak and rub to coat both sides. Allow steak to come to room temperature, about 45 minutes. Heat grill to medium-high heat (about 450°F). Season steak with 1 teaspoon salt and 1/2 teaspoon black pepper. Grill steak until desired doneness, about 4 minutes on each side for medium-rare. Allow steak to rest for 10 minutes after grilling. Thinly slice diagonally and across the grain. Remove and discard woody ends of asparagus (bend each and it will break where woody end begins). Drizzle 1 teaspoon olive oil on asparagus. Sprinkle 1/2 teaspoon salt and 1/4 teaspoon black pepper on asparagus. Grill asparagus until crisp-tender, about 2 or 3 minutes. Cook pasta according to package instructions. Reserve some of the pasta water to use if needed. Drain pasta. While pasta is cooking, melt butter in a large saucepan over medium-high heat. Add flour, stir, and cook for 1 minutes. Slowly pour in milk, whisking constantly while pouring. Add remaining 1/4 teaspoon salt and white pepper. Bring milk mixture to a boil, stirring constantly. Add 4 ounces blue cheese and continue to cook and stir until cheese is mostly melted (there will be some lumps). Fold in most of the bacon, steak, and asparagus. If sauce becomes too thick, stir in a little of the reserved pasta water. 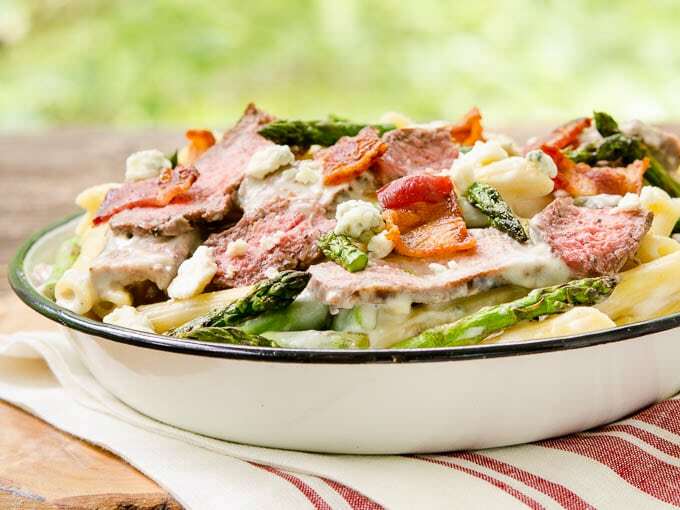 Serve topped with remaining bacon, steak, asparagus, and blue cheese scattered on top. Wow, decadently good! Guess that’s what bacon recipes are all about. 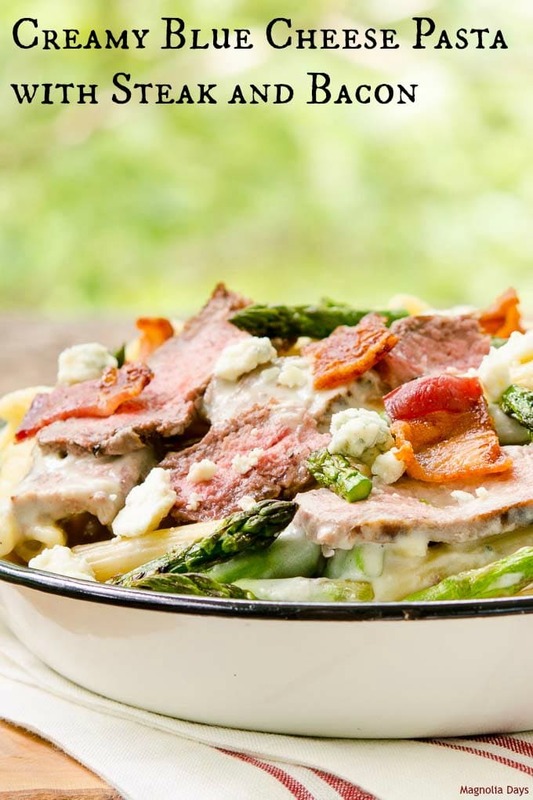 Bacon, steak, blue cheese.. this pasta is a winner meal! I can just imagine your face, Renee! I am still gasping over someone being TIRED of Bacon. I didn’t think that was possible. I know if I were in your house, I probably wouldn’t have left you any so I guess you should be glad Mark only took one portion. You are talking my love language here! If we weren’t both already married, I would have proposed on the spot! How could this not be good with all those ingredients! Well this certainly has ALL of my favorite things going on!! I’m sure you know how picky Bill is—but he actually likes blue cheese. He’d love this pasta—what an amazing combination of flavors! Wow this looks delicious! So many of my favorite things in one bowl! Haha! Bacon, good. Steak, good. Asparagus, good. And pasta is a no-brainer! The blue cheese though.. well, if your husband gobbled this up and the only thing he previously liked was the steak, then I can definitely give the blue cheese sauce a try!